Rapid Application Development (RAD) is an incremental software development process model which is a “high-speed” adaptation of the linear sequential model in which rapid development is achieved by using component-based construction. If requirements are well understood and project scope is constrained, the RAD process enables a development team to create a “fully functional system” within very short time periods, such as in 60 to 90 days. This step works to understand the business problems and the information characteristics that the software must accommodate. This is very important as multiple teams work on different systems. 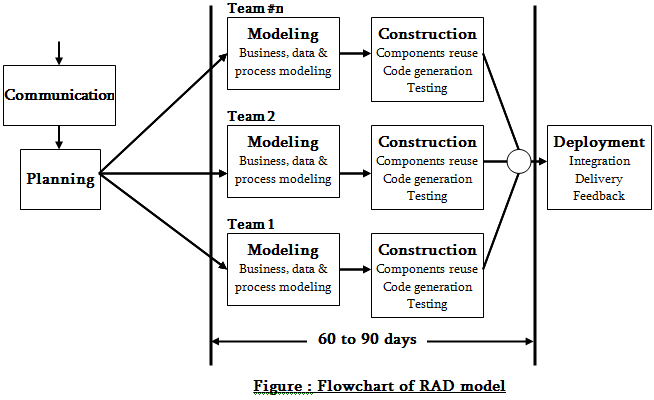 Modeling includes the major phases, like business, data, process modeling and establishes design representation that serves as the basis for RAD’s construction activity. This includes the use of preexisting software components and the application of automatic code generation. Deployment establishes a basis for the subsequent repetitions, if required. Like others, RAD approach has backwards. For large but scalable projects, RAD requires sufficient human resources to create the right number of RAD teams. If developers and customers are not committed to the rapid fire activities, RAD projects will fail. RAD may not be appropriate when technical risks are high. If a system can not be properly modularized, building the components will be problematic. If high performance is be achieved through tuning the interfaces into system components, the RAD approach may not work.